Grace and Peace to you, and thank you for visiting my blog site. Through this blog, I am grateful to have the opportunity to share of myself and of what I love. I hope you find this a safe “place” to be, a sanctuary wayside for those on a spiritual journey. Welcome! I am glad you are here. May all gentle souls of every faith, philosophy and orientation of love find spiritual respite in this circle of virtual community. These words were written by Abbess, Saint and Doctor of the Church, Hildegard of Bingen around 1142 AD. (1098 AD – September 17, 1179AD). The youngest of 10 children, Hildegard was sickly as a child. However, she would later write that she experienced many visions or understandings of God which she kept to herself. At the age of eight years old, it appears that Hildegard was placed in the care of a young woman named Jutta, the daughter of Count Stephan II of Sponheim. In the year 1112, when Hildegard was 14, the two women were enclosed together in a convent at Disibodenberg in the Palatinate Forest in what is now Germany. The written record of the Life of Jutta indicates that Hildegard assisted her in reciting the Psalms, working in the garden, and tending to the sick. As an adult mystic, Hildegard wrote theological, botanical and medicinal texts, as well as letters, sermons, liturgical songs, and poems, while supervising miniature illuminations in the Rupertsberg manuscript of her first work, Scivias. Since my earliest childhood memories, I have been deeply in love with Creation and the Creator who shines through all of it. I spent much of my childhood and youth keeping my love of God and Nature (and the intimate connection I perceived between the two) quietly to myself. My parents were both self-described Agnostics of humanist inclination, though they had a clear ethic regarding the environment and the ethical treatment of animals. Though I was encouraged to express my sense of being connected to nature, it wouldn’t do to be overtly spiritual about it. This was true even from my mother’s perspective, who (while quite influenced by her father’s Canadian First Nation’s identity as a Shackan Native) remained ambivalent as to whether the Sacred could also be conceived as a Divine Being whom one could love and be loved by. Consequently, while growing up, I found that spirituality was most safely engaged as an intellectual exercise of study and learning about diverse religions, folklore tales, myths and symbol systems. Additionally, in my immediate family, any mention of God (or belief in any deity for that matter) was akin to placing a large target on one’s chest in invitation of the verbal barbs and arrows of ridicule. I also didn’t feel safe to share my experiences of God with the Christian part of our extended family, because I intuited that what I might say would (sometimes radically) challenge their traditional Christian beliefs. As a child and into adulthood, I was not then nor am I now interested to alienate or judge my family – I do not desire to impose my beliefs on anyone. My path is my own, and I deeply respect theirs. My entry point into Christianity around the age of 10 was through St. Francis of Assisi. At that age, I had discovered naturalist and archaeologist Loren Eisley’s “The Immense Journey” and experienced in him both a spiritual mentor and a kindred spirit. Upon coming home from grade school one day, I asked my mother why Christianity did not seem to view creation as a text for understanding the nature of God when so many other faith traditions through history did. My mother shared her own frustration on that score but also offered that St. Francis was the patron saint of ecology. At the same time, she gifted me with a small carved fetish of a bear. I would later come to understand bear medicine is oriented toward healing, spiritual protection and self sacrifice, themes which also play out powerfully in the story of Christ. I eventually became formally Christian while in college at the State University of New York at Geneseo. I felt both glad and panicked by falling in love with the Divine all over again, while attending services at the Trappist Monastery of the Piffard, just across the Genesee valley from my college campus. I took St. Francis’ name as a confirmation name when I was baptized and confirmed in the Roman Catholic Church. In my Medieval history classes, I learned about Hildegard von Bingen and Julian of Norwich and added them to my growing list of creation-centered Christian mystics. I was glad to encounter and acquire every pre-Christian cross over of creation-centered Christianity as well as modern and post modern Christian theologians and scholars of the same inclination (such as theologian Thomas Berry and physical cosmologist Brian Swimme). Sadly, I spent my early adulthood running away from my spiritual heart, which is to say, I immersed myself in graduate studies and was as academic as any intellectual research academic could ever be. While still fundamentally denying the validity of my own spirituality, I gained an MA in Cultural Anthropology from the University of Alaska in Fairbanks and nearly lost my joyful spirit forever in a soul-numbing PhD program in Folklore Studies (I won’t say where). Suffice to say that certain professors and college administrators there were some of the least cultivating I have ever encountered – they seemed far more interested in my tuition money than in my mind and heart for learning. From that experiences, I was rescued (in every way there is to be rescued) by an invitation to attend Loyola University in Chicago’s Institute of Pastoral Studies. There I was provided full scholarships for all three years of my MDiv. program. I was Catholic while in Seminary and may be something of an oddity in that I am an Episcopal priest who is also a member of the National Jesuit Honor Society. After graduating from seminary and after nearly a lifetime of struggling with a call to vocation, I finally could no longer deny a deep sense of being called to spiritual leadership, in the Christian instance – priesthood. During a period of time when I was training to become a professional healthcare chaplain, I became an Episcopalian. Seven years later I was ordained as an Episcopal priest. The time is ripe for the Greening of the Church. If through God all things are possible, then Creation is the medium by which Divine visions bear fruit. With Francis, Hildegard, Julian and other spiritual ancestors, my dream is of a church community in tune with Creation – working with Creation rather than against it, realizing the peaceable kingdom on earth in a respectful relationship with all beings. From bees to elephants, from corn and grain to rain forests and tundras, humans must be good stewards for the sake of all life – not just for our own species. The Word did not come to inspire only us to new life, but to nurture all life verdantly through us. 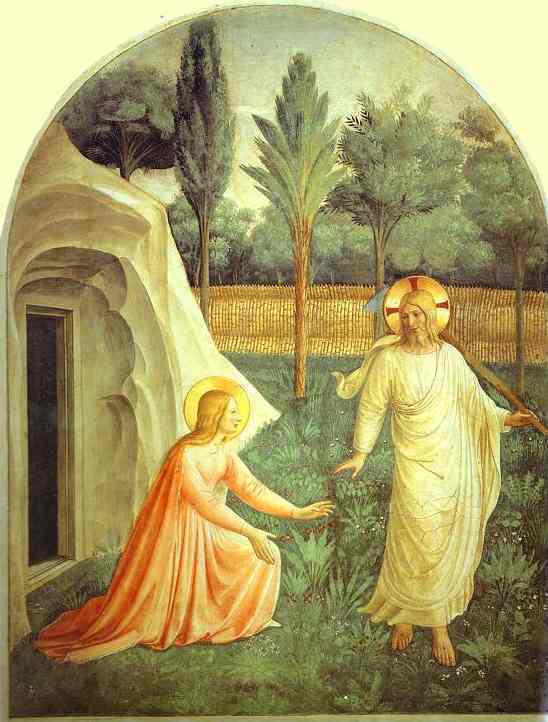 When the resurrected Jesus appeared to Mary the Magdalene, he seemed to her to be a gardener. He is, perhaps, as Fra Angelico depicted him, deliberately dressed as a gardener, since he is depicted carrying a hoe over his shoulder (in paintings by other artists, Jesus is alternatively depicted carrying a shovel, a rake, or a trowel). As a gardener, Jesus models the work of a laborer in the verdant greening of Creation and helping to make all things new. The imagery is suggestive of the New Adam who restores Eden by purposefully cultivating it – both recognizing and affirming its sacred origin and nature. I believe, if we are to be faithful followers of Christ, we must be Spiritual Gardeners of God’s Creation. We must seek justice and quality of life for all creatures. We must work to replace an ideology of domestication v. wildness with a theology of respectful collaboration for mutual enhancement of our lives on this Earth. Earth healthy agriculture and husbandry, energy resource development, architecture and building practices, life-giving distribution of wealth and resources, must all be informed by spiritual practices of gratitude, compassion and sustainable living. Ultimately, our core relationship with God is experienced in our relationship through, with and to Creation. Yes, it is time for a for Greening the Spirit of the World, and I am committed to being a Greening Spirit on God’s behalf within the truest and best cathedral – Creation. May our common commitment draw us together in the circle of Creation for greater health in body, mind and spirit for all. Rachel, I am so glad you decided to allow a web presence where the beleaguered who drank once from such a full cup can again find water! Thank you, Sherry! It’s so lovely to be in connection with you. Welcome back to the Northwest! Thank you! I missed everyone very much, but now I miss people on two coasts. Blessings! Greening Spirit and am very thankful to have read your account of traveling in Israel/West Bank/Jerusalem and all…..so beautifully written and so informative. I so agree with you all around…..the horror of people being considered a resource equal to land, etc. as “wild” and free for the taking and/or dis-occupation. Thank you so much for sharing your great love for God, people, nature and all. May God be with you and yours, always! ~ Ellen Caamano, NJ U.S.A. Thanks so much for visiting my blog site, Ellen. I LOVED our trip to Skillig Michael, Ireland. My time in Israel and the West Bank was deeply moving, and I’m grateful for your support. Blessings and Peace to you always, Sister Pilgrim. We haven’t met but I know you know of myself and MK, my partner through Nigel. I hope we well soon meet. I too first encountered the mystical connection with nature through Loren Eisley, The Immense Journey. I share your connection to nature as the WORD, the expression of the Divine Mystery and your love for Hildegaard. I hope you will visit my blog and follow as I have yours, if you like it, of course. http://www.careislikewater.blogspot.com. Have you been to Whidbey Institiute? I think you will find a connection to Whidbey Institute where your love for Thomas Berry and Brian Swimme are honored. I don’t know if you’ve seen this video. I think it should be called GRACE. https://www.youtube.com/watch?v=wJyUtbn0O5Y. Blessings on you Rachel.